Pityriasis rosea (PR) is an acute, self-limited papulosquamous dermatosis localized on the trunk and extremities, that affects otherwise healthy adolescents and young adults. Although the classic presentation is readily recognized, atypical forms may present a challenge. Many atypical forms of the disease have been reported in the literature.We report two cases with atypical features. 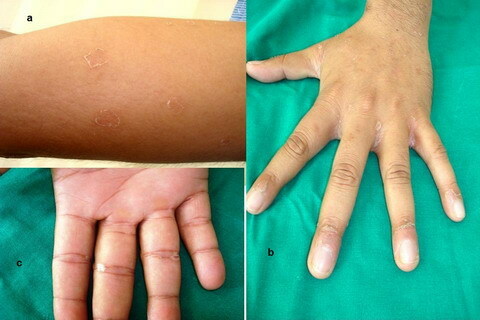 Involvement of nail folds and web spaces of hands was seen in one case while vesicles on the erythematous base were seen in other. Two cases of PR, with atypical presentations are being described in this report. A 30-year-old man presented with multiple asymptomatic red raised scaly lesions, mainly on upper extremities and few on abdomen since last 1 week. There was no history of any preceding coryzal symptoms, herald patch, unprotected sexual exposure, vaccination, drug intake or photosensitivity. Examination revealed discrete erythematous scaly patches of variable size on arms, forearms, proximal nail folds, palms and web spaces of bilateral hands. On closer examination, the rash showed peripheral collarette scaling over arms and forearms. (Fig1) The face, scalp, trunk, soles and mucous membranes including genitalia were uninvolved. Based on above findings, a diagnosis of secondary syphilis, atypical PR and pityriasis lichenoides chronica were thought. His complete blood picture, liver function tests and clotting profile were normal. VDRL, HIV antibodies and antinuclear antibodies were negative. Potassium hydroxide mount of scraping from scales revealed no fungi. Biopsy from representative lesion showed focal parakeratosis, mild epidermal hyperplasia and spongiotic vesicles in epidermis containing lymphoytes, papillary dermal edema, extravasation of RBCs around superficial vascular plexus along with moderately dense perivascular lymphocytic infiltrate. (Fig 2) Based on clinicopathological correlation, a diagnosis of atypical PR with nail fold, web space and palm involvement was made. Patient was given oral erythromycin 2gm per day in four divided doses for 7 days along with topical mid potent steroid cream and moisturizers. Lesions did not increase and patient reported improvement after 2 weeks. Lesions cleared completely over 4 weeks. A 28- year old unmarried male presented with multiple asymptomatic red raised and fluid filed lesions on his abdomen and lower back since 3 days. Recently he noted that lesions are increasing in number and new lesions are coming on upper extremities. There was no history of any preceding coryzal symptoms, herald patch, unprotected sexual exposure, vaccination, drug intake or photosensitivity. Examination revealed multiple discrete erythematous, edematous papules and vesicles on erythematous base, involving mainly abdomen, lower back and few on upper extremties. Size of vesicles was variable with largest being up to 0.2- 0.5cm in diameter. No scaly plaques were seen. On closer examination, there was tiny crust at the top of some vesicles. (Fig 3) Vesicles were distributed along the lines of cleavage. The face, scalp, lower extremities, palms, soles and mucous membranes including genitalia were uninvolved. He denied application of any irritant application locally. There was no evidence of any other skin infection on his body. Based on above findings, a diagnosis of Id eruption, vesicular PR and irritant contact dermatitis were thought. His complete blood picture, liver function tests and clotting profile were normal. VDRL, HIV antibodies and antinuclear antibodies were negative. His routine stool and urine examination with microscopy revealed no abnormality. Biopsy from one of the vesicle was done. It showed focal parakeratosis, moderate epidermal hyperplasia, large intraepidermal spongiotic vesicles with exocytosis of lymphocytes papillary dermal edema, extra-vasation of RBCs around superficial vascular plexus along with moderately dense perivascular lymphocytic infiltrate. (Fig 4) Based on clinicopathological correlation, a diagnosis of vesicular PR was made. Patient was given oral erythromycin 2gm per day in four divided doses for 7 days, single triamcinolone acetate 40mg intramuscular injection along with topical mid potent steroid cream and calamine lotion. Lesions did not increase in number and patient reported improvement over 3 weeks with nearly complete clearence. In first case described here, atypical features included lack of involvement of back and Christmas tree pattern, involvement of palms along with web spaces and proximal nail folds of bilateral hand fingers with exfoliation along with typical papulosquamous plaques with collarette scales. (Figure-1) We could not find report of nail fold exfoliation in PR with involvement of web spaces in literature. In second case, atypical features includes, vesicular lesions on erythematous base with variable size from 2mm to 5mm without typical papulosquamous eruption of typical PR, and lack of herald patch. The diagnosis was based on clinical appearance of the lesions and histopathological findings in both the cases. There was no suggestion of herald patch in both the cases. In both the cases lesions subsided over a period of 6-8 weeks and patients are free of symptoms as per communication. There was no residual pigmentary change or scarring noted in both cases and no recurrence is seen till now. Atypical cases of pityriasis rosea (PR) are fairly common and less readily recognized. Physicians should be aware of the wide spectrum of PR variants so that appropriate management and reassurance can be offered. Two cases described here would help to increase recognition of PR. 1. 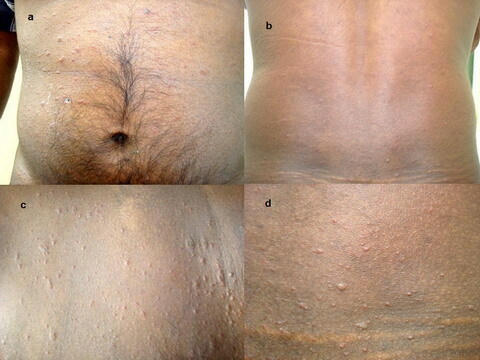 Chuh, A., Zawar, V. and Lee, A. Atypical presentations of pityriasis rosea: case presentations. J Eur Acad Dermatol Venereol.2005; 19: 120-126. 2. Braun-Falco O, Plewig G, Wolff HH, Burgdorf WHC. Dermatology: Springer- Verlag,2000.pp584-5. 6. Parsons JM. Pityriasis rosea update. J Am Acad Dermatol 1986; 15: 159-167. 9. Anderson CR. Dapsone treatment in a case of vesicular pityriasis rosea. Lancet 1971; 2: 493. 10. Chuang T, Perry HO, Ilstrup DM, Kurland LT. Recent upper respiratory tract infection and pityriasis rosea: a case control study of 249 matched pairs. Br J Dermatol 1983; 108: 587-591.